Christine Rayburn near the “blessing box” she started on Salem Avenue. Christine told she had recently moved from Silverton and could not help but take notice of the number of apparently homeless people in Albany. She does not believe in giving people money, but she wants to help. She had seen the idea of a box like this online somewhere else and thought she would try it too. The box has been up a few weeks, and its offerings have expanded from food and toiletries to cast-off clothing and even toys. There used to be just the actual box attached to a pole, and now there are a couple of sets of shelves of stuff. 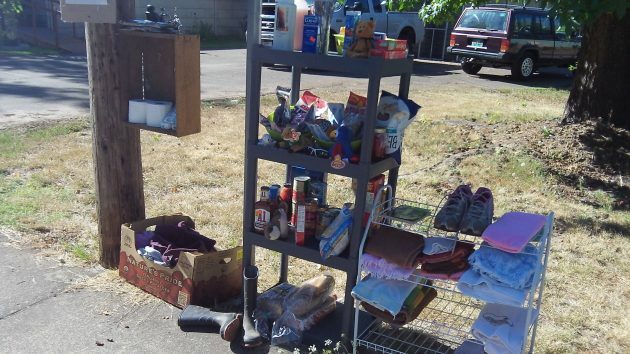 On the porch of the trailer where she and her family live, a couple of covered bins hold donations she’ll add to the box when people have taken some of the items sitting out now. She told me her next-door neighbor helps with the project, and others nearby are supportive as well. 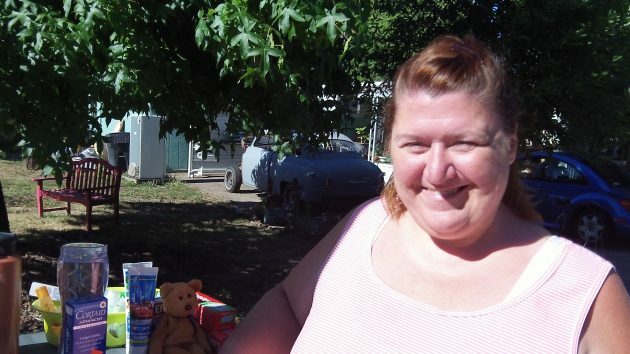 Christine hopes to go back to work as an educational assistant. She isn’t working now because she’s just moved to Albany. 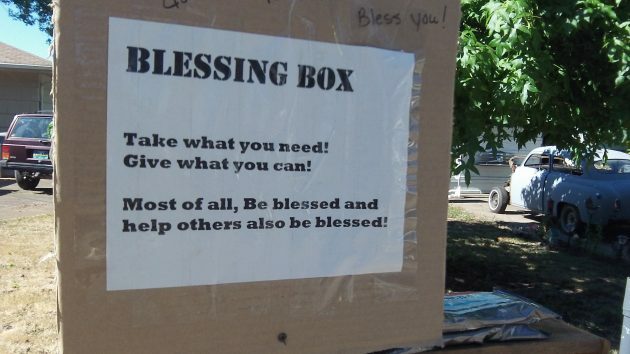 She plans to keep the blessing box going, though, and thinks maybe some other neighborhoods might try it too. As for the box outside her place on Salem Avenue, she says it has been getting steady use. Her husband plans to build a better box, she told me, one that can withstand the elements when the weather turns. It’s not just the single box on the pole anymore. Chrissy is my best friend and this does not surprise me in the least! She is always helping people and offering services to others. Truly one that sets the example for the rest of us! Way to go sis! That Lady, I have known for many years. It does not surprise me. She has always had a Heart Of Gold! Love that girl. We don’t have to look very far to find someone in great need. Even over our back yard fence, there could be someone that is in great need of something. Now, I ask this question: What Would Jesus Do? Well, of course, He would help the down & out. Are you Trumps half-brother? You seem to have the same condescension for people trying to help other people. Engel is on to something here. City Councilor Kellum has made it clear that Food Carts and any other effort citizens might make to earn a living or to help out the less fortunate is against the Kellum Sensibility. As such, these pathetic efforts must be shut down and their operators flogged publicly. Given Kellum’s propensities, we can expect the closure of any unlicensed, unregulated attempts to help those in need. Sorry Hasso, but in your desire to expose this wonderful woman’s charitable activities, you may have sealed her fate. Good for her! Positive thoughts her way as the journey continues!! Must ask, in a world of so many haves & have nots, how did we get here? To this point? Please don’t take this as a criticism for what she is doing. I fully support helping the poor and other in need. However, I recall as a pre-teen back in the 1970’s being taught not to attach items to telephone or utility poles. I had a family friend who was a lineman, whose job entailed climbing poles and fixing wires. He could not do his job when folks attached items to the pole, he would have to take time to remove the objects first, which impacted his productivity. Bi-Mart has cheap, blank yard signs which could be used to replace the sign on the pole. The box really should be moved to a stand or something away from the pole also. Point well taken. A box attached is much more than a concert flyer tacked to the pole. Said box could reduce service restoration time on any outage be in power or internet/TV/phone. Serves as a nice reminder for property owners to trim back the bushes from utility access points as well. From the image, it looks like many more items for the needy are nicely adorned on shelving anyways.